Every teacher is asked to donate an item to our annual school auction. I decided upon donating an 18″ doll and accessories after finding the handmade school uniform made for my daughter’s A.G. doll. The package has grown. LOL. Every doll needs a bed, right? IKEA’s solid pine Duktig bed fits 18″ dolls perfectly; but it is a little bland. As a good portion of the U.S. has been sweltering in this unbearable heat; we’ve continued to work on the garage laundry nook area while taking many water and puppy breaks. Wait. What? May I introduce little Tollach, better known as Tolly, our 9-week old maltipoo puppy. It’s that time of year, again. I must get back to school and lesson plans. So how much can we cram in a weekend? 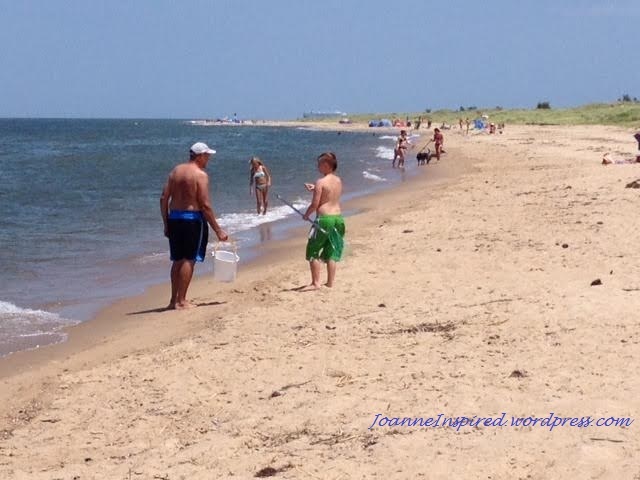 Spent time on the beach with George and Connor . . . 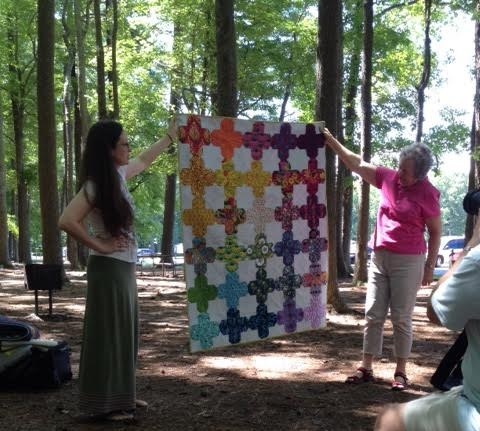 Attended an outdoor soireé featuring Alison Glass with her handcrafted fabrics and quilt sample ideas . 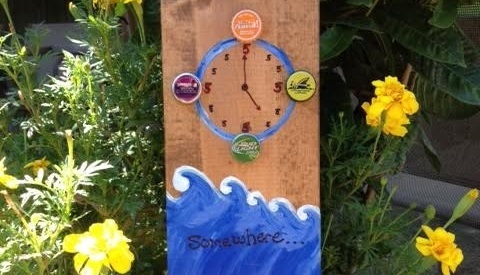 . .
And made a tiki bar beer bottle opener for my friends. 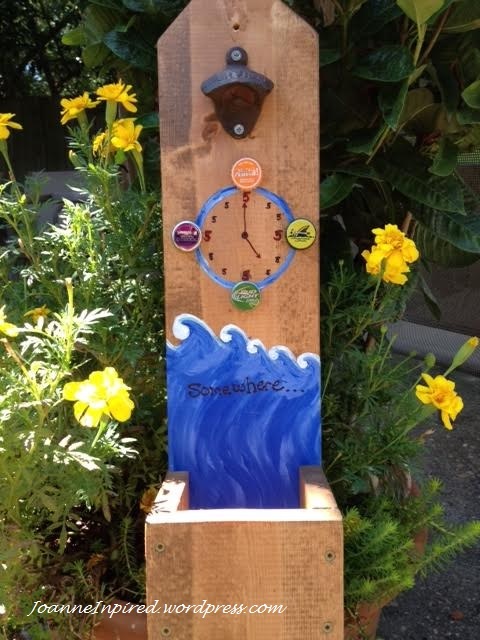 This was a very easy and quick project. 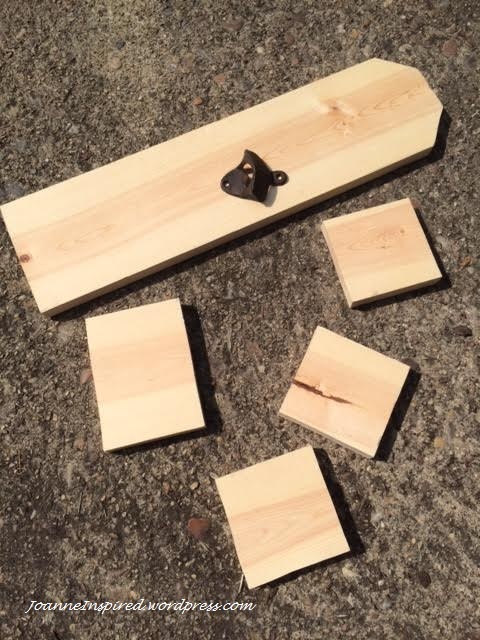 How: Cut wood into 1) 22″ length for back, 2) 4.5″pieces for sides, 1) 4.5″ x 4.5″ piece for bottom and 1) 4.5″ x 5.5″ piece for the front. Attach front to sides with screws. 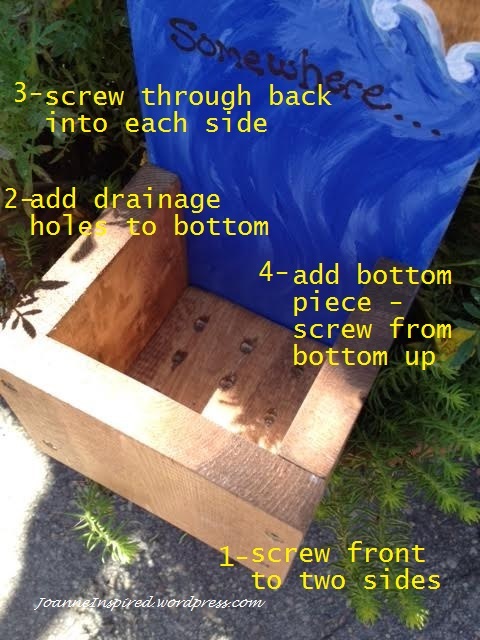 Drill holes into the bottom for drainage. Then, screw through the back into each of the side pieces. Screw on bottom piece (from bottom-side up). Add decoration – there are a ton of design ideas online. 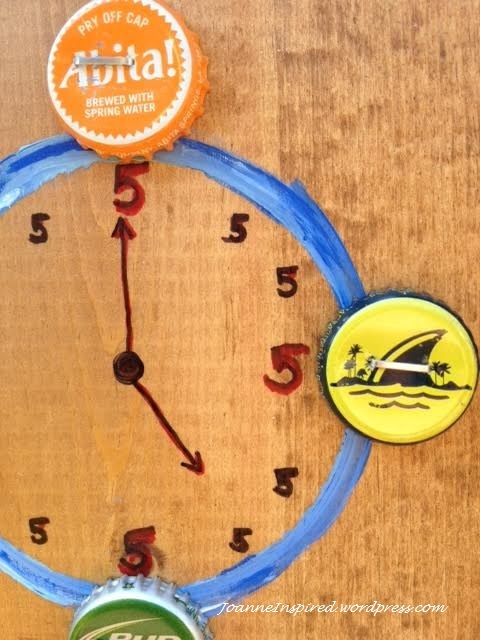 I painted a clock face and attached bottle caps using a staple gun. Lastly, attach the bottle opener (ours came from Total Wine). George has an awesome gift: he can look at a photo (“I want it to look just like this”) and in turn, build whatever piece of furniture requested. This gift came in handy as we helped our son-in-law and daughter paint and decorate their first new home these past few weeks. 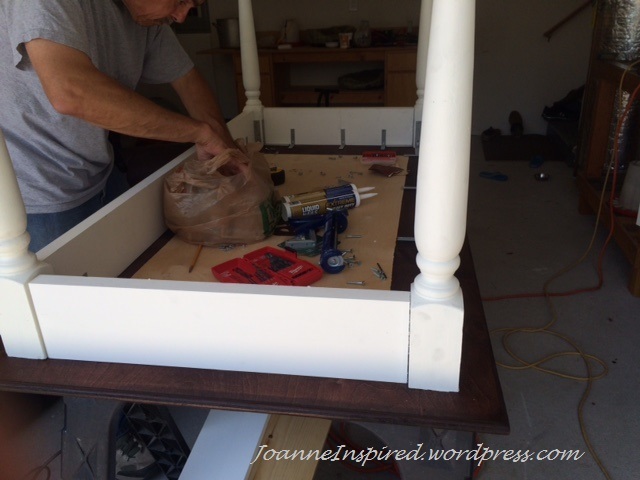 The one thing our daughter requested was for her dad to build a keepsake farmhouse dining table. 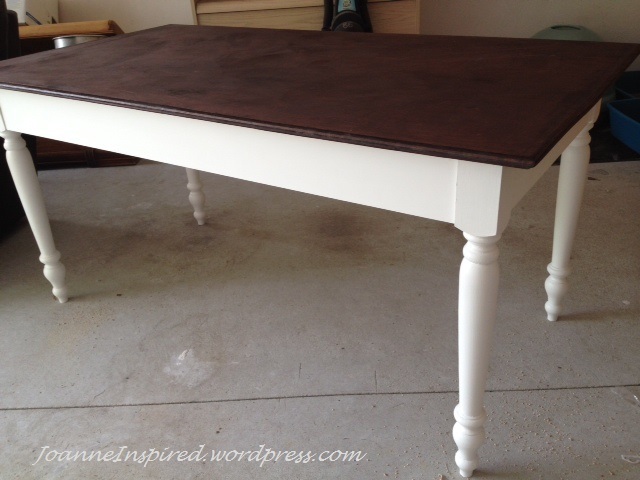 Brianne and I painted the apron and legs a white chalk paint wash. Later, she applied Minwax Red Mahogany stain and a satin Minwax clear coat to the top.